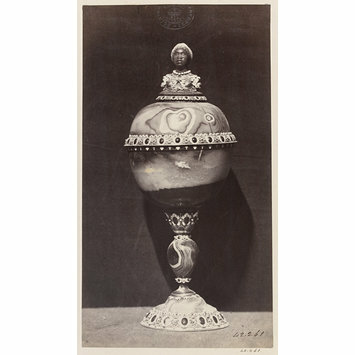 This is one of a series of photographs by Jane Clifford of ‘Treasures of the Dauphin’ – the collection of vessels of rock crystal and decorative hardstones embellished with gold and silver mounts, precious gems and pearls inherited by Philip V (1683-1746) from his father, Louis, the Grand Dauphin of France (1661-1711) in the collection of the Royal Museum, Madrid (now the Prado). 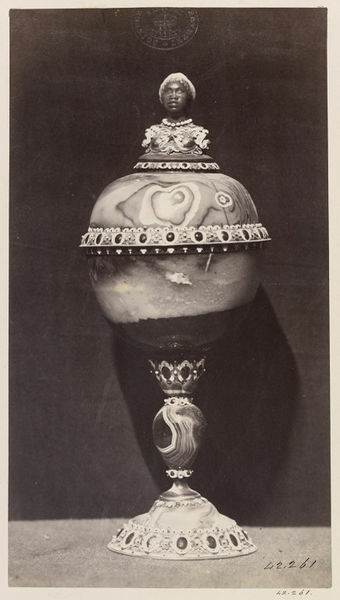 Jane and her husband Charles established a photographic studio in Madrid in 1850 and photographed many objects in the Royal Collection. Upon the death of Charles in 1863, Jane continued to run the studio. The 'Treasures' were photographed by Jane for the Department of Science and Art by the express permission of Her Majesty, the Queen of Spain (Isabella II) at the instruction of J.C. Robinson, Curator in the Department of Science and Art for the South Kensington Museum (which was to become the V&A).